| The Fitzroy. By Sally Fiber. An autobiography of a London Tavern. New edition 2014. Fitzrovia was the name given to Bohemian London in the early part of the 20th century as a result of writers, artists and politicians frequenting The Fitzroy Tavern. 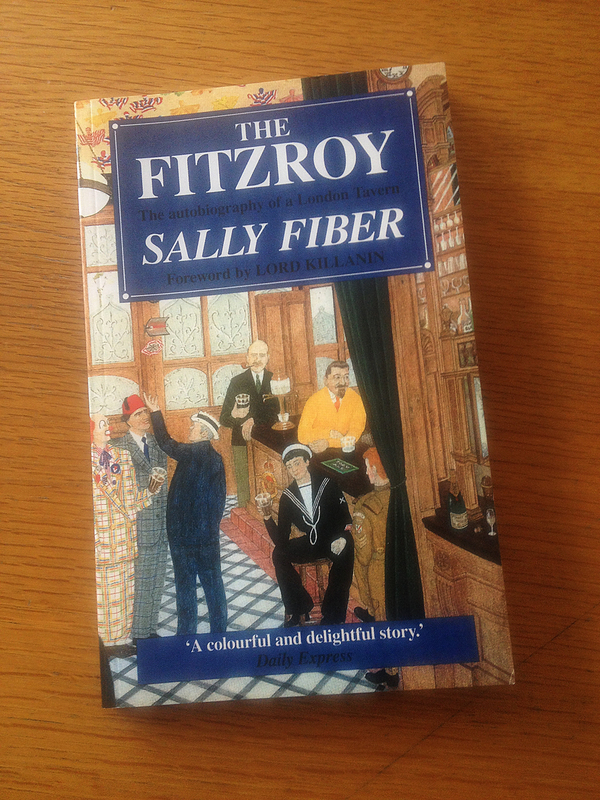 Born and brought up in The Fitzroy during its heyday, Sally Fiber draws on her own memories as well as family archives, to recall the special place, time and state of mind that was Fitzrovia. As the child and grandchild of the Tavern’s licensees, she provides a unique record of the years when, for example, Augustus John drew a self-portrait in her mother’s autograph book, and when Wynford Vaughan-Thomas held a memorial service in the bar for Dylan Thomas. A most unusual charity was established in 1923, ‘Pennies from Heaven’, as habitués would aim paper darts containing money at the ceiling – now the Charity is independent and called Fitzrovian Pennies, with a remit to captivate and cultivate creativity in Children of all ages, celebrating Fitzrovia’s rich creative history. But whilst the sense of the rich and the famous shines through, so too does a more shadowy world. For the Tavern was also the haunt of detectives Bob Fabian and Jack Capstick, the Public Executioner Albert Pierrepoint and politicians Hugh Gaitskell and Tom Driberg. Murder, intrigue and even a police raid on The Fitzroy – which culminated in a fierce courtroom battle – reveal the other side of this London pub. Full of incident and anecdote, The Fitzroy ensures that the days of laughter, triumph and tragedy come to life once more.